The reporting meeting has long been a critical element of any successful client/agency relationship. That time of the month, or quarter, where agencies review the impact of the work they’ve completed toward a client’s goals or objectives. And sure, while the tools agencies are using and even the manner in which they report on performance continues to evolve, it’s clear from the agencies we spoke with that frequent performance updates are essential. According to respondents to our most recent report, 61% of marketing agencies say they run client reporting meetings on a monthly basis. 23% say they hold reporting meetings on a weekly basis, while 10% hold them quarterly, and 6% admit to having them infrequently. *Editor’s note: Keep in mind that many of the agencies we surveyed are Databox users, therefore monthly (and weekly) reporting frequencies are seen pretty favorable here. Our guess would be that, with a larger and more diverse sample size, the number of agencies delivering monthly and weekly performance reports would be less. 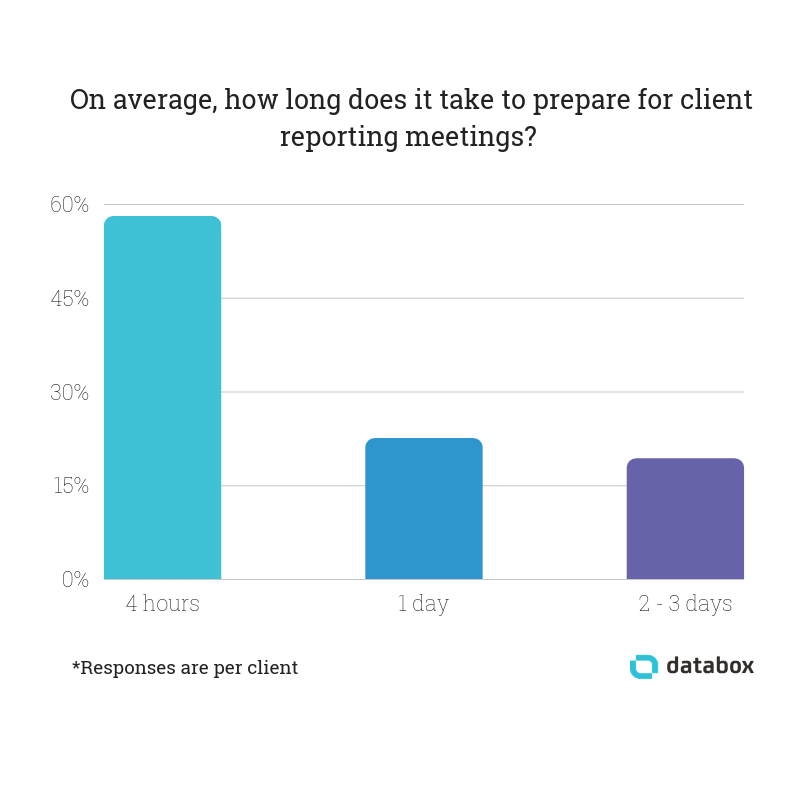 We also learned that client reporting meetings are a big investment of time, as 58% of respondents said it takes an average of 4 hours per client in order to prepare for a client reporting meeting. 42% of agencies say it takes at least one day per client to prepare–23% said it takes one day, while another 19% said it takes an average of 2-3 days. 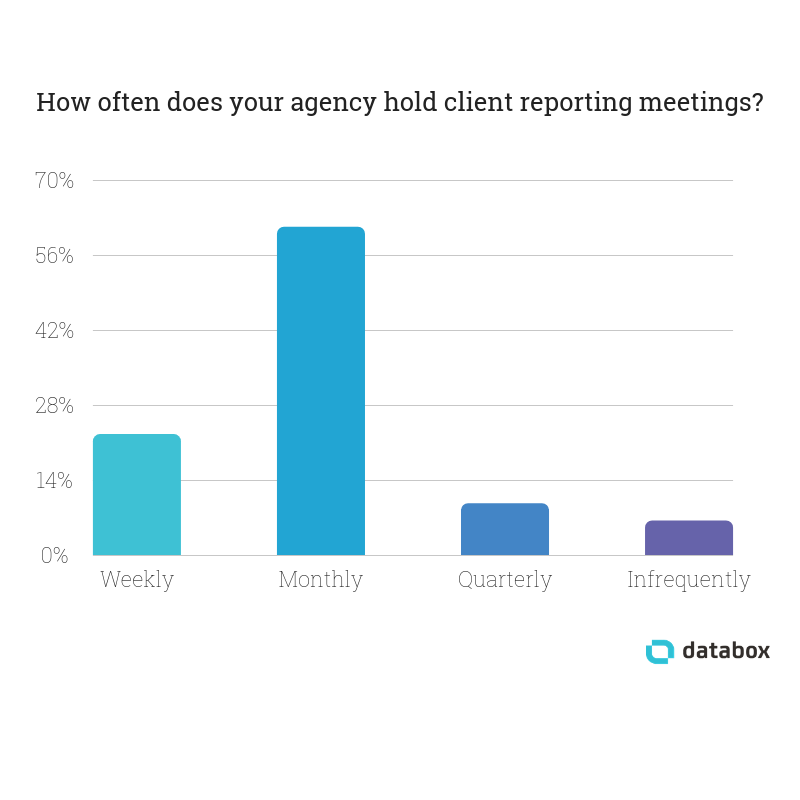 *Editor’s note: For agencies using Databox, we asked them to answer with the time it took prior to implementing Databox. One of the biggest reasons prepping for a single client reporting meeting takes so long is the number of tools that agencies need to pull data from. 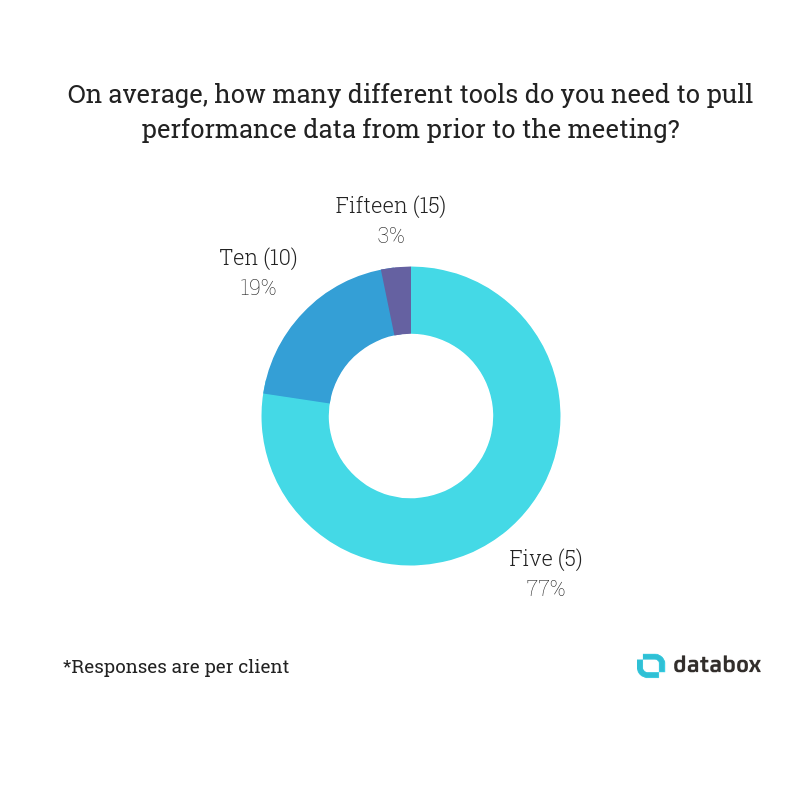 Of the agencies we surveyed, 77% said they pull data from 5 different tools in preparation for a reporting meeting, while 19% said they pull from 10 different tools and another 3% pull from 15. All of these points clarify a common theme–client reporting meetings are a big investment of time. So, how can agencies ensure they’re getting the most from that time so that both the agency and client walk away with actionable, productive insights? We asked 31 agencies to share their insights and experiences for running effective reporting meetings. Here’s what we learned. 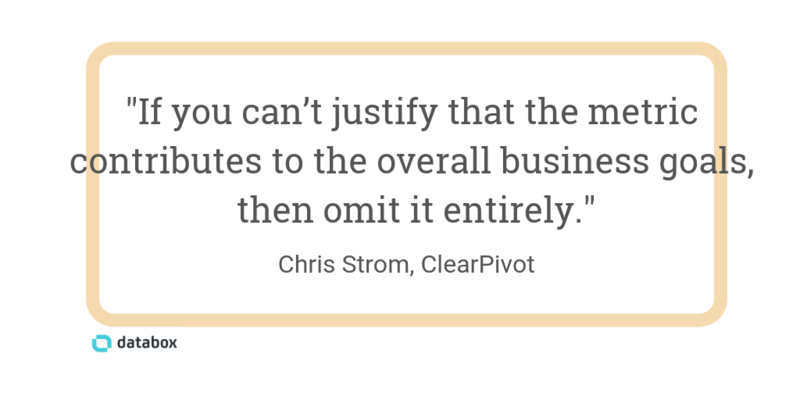 Editor’s note: Are you wasting hours building client reports every month? Create a free Databox agency account to automate your client reporting, track performance in real time, report results as they happen, and more. “Reporting is all about telling a good story, and supporting that story with relevant data,” says Meghan Hultquist of HQdigital. “Limit the amount of KPIs you’ll present to the client,” says SparkReaction‘s Kelly Groover. But, it’s still important to know the metrics and measures. 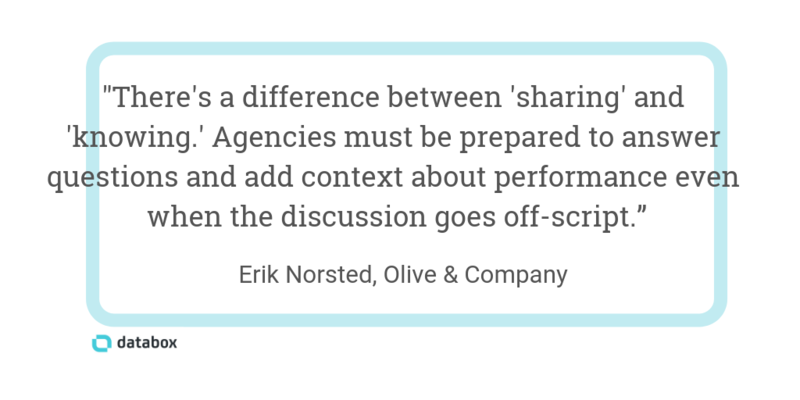 “Share only the essential data, but know the rest,” suggests Erik Norsted from Olive & Company. “Clearly outline the business results of your work,” says Adrian DeGraffenreidt of CoCreative Management. “Numbers are not good enough. You need charts, graphs, heatmaps, and recorded visitor sessions. Let these visuals do the talking. 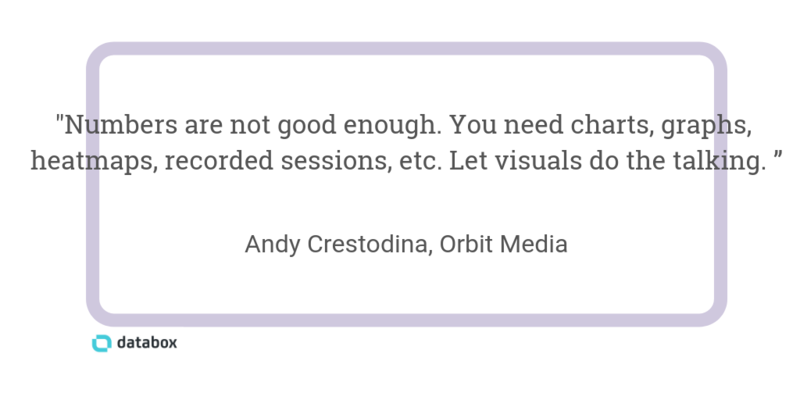 Show the chart, pause for a moment of silence, and then start the discussion,” says Andy Crestodina from Orbit Media Studios. Even though you should avoid overwhelming your client with data, you should still have it available. “We always recommend having the original data source in front of you before walking into the meeting, to answer the client’s additional questions,” says Futurety‘s Sam Underwood. Tracy Julien from Guided Choice likes to send relevant documents ahead of time to everyone involved in the meeting. But don’t get too complacent, says LyntonWeb‘s Jennifer Lux. Penguin Strategies schedules “an interview review [with] colleagues that are less familiar with the account,” says Nili Zaharony. “Don’t use a ‘one-size-fits-all’ mentality with your reporting,” says Lightbulb Media‘s Lewis Kemp. And don’t be afraid to show off your successes, says McMahon Marketing‘s Kalie Fry.